Fig W780: Looking north to Structure 1B-5The Acropolis at Quiriguá sits at the very southern end of the archaeological site and consists of 4 structures arranged around a central plaza. 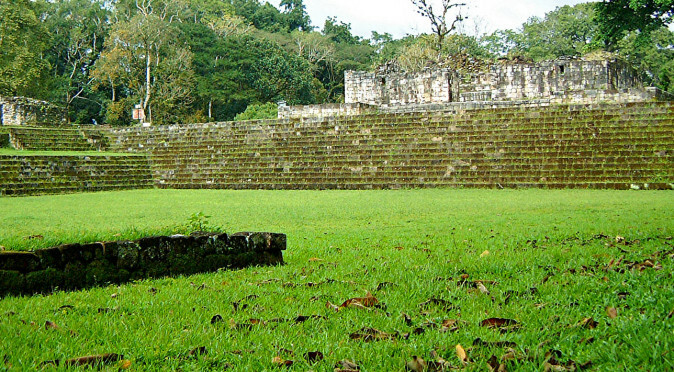 The main three structures around the Acropolis are the work of the last three rulers of Quiriguá and in particular the final ruler, Jade Sky. The plaza is effectively shut-off from the rest of the city by a building added to the north side of the plaza by Jade Sky, Structure 1B-5. Fig. W0370 is the view across the Acropolis Plaza from Building 1B-1 and to gain access to the rest of the city from this position, you have to walk up the stairs to the left of Building 1B-5, which sits at the top of the stairs, through the gap between the buildings, and then down a far steeper set of stairs to the ball-court plaza which leads out on to the Great Plaza and the rest of the site. This unusual set-up is thought to demonstrate Jade Sky’s increasing concern of attack, and therefore a desire to make the Acropolis more defensible by closing off the north end. Fig W0970: Rear South Corner of AcropolisThis fear may also be evidenced by Jade Sky’s other prominent building, 1B-1, which closed of the south end of the Acropolis and acted as its southern perimeter. In fig. W0970 you can see the imposing high walls of finely cut stone and rigid multi-level platform if Structure 1B-1. This wall not only demonstrates the craftsmanship that Jade Sky had at his disposal, but also highlights Jade Sky’s desire to use the walls of his buildings to protect the Acropolis. 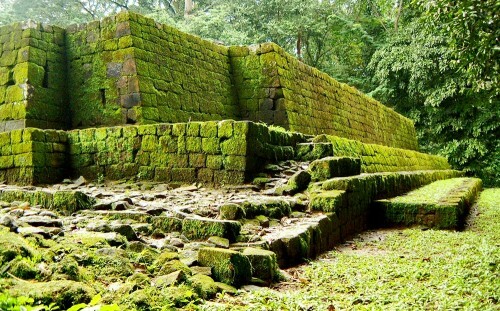 This is in total contrast to the earlier walls built by Cauac Sky to adorn his palace structure (fig. W0971). 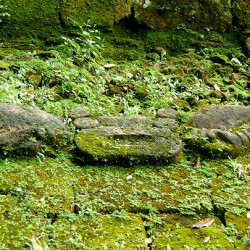 Fig W0781 – Carved Step that leads up to Structure 1B-1. From the front it is clearly a palace or temple structure designed to glorify Jade Sky. 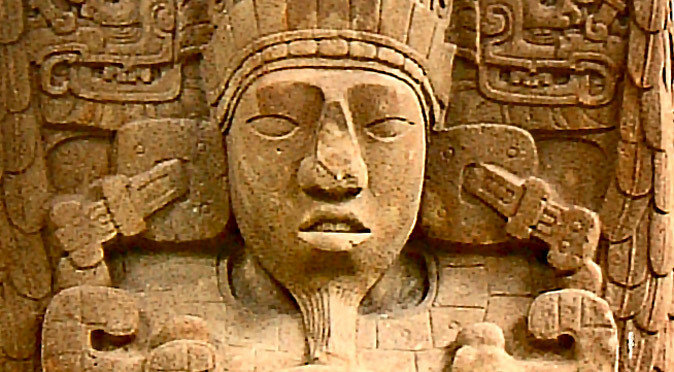 One has to remember that Mesoamerican rulers were believed to be almighty and divine and constructing defenses was strategically difficult for a ruler, as it would suggest he was fearful of defeat and therefore not divine. To avoid such insinuations, it seems that Jade Sky built glorious temples in his honour, that were actually there to provide defensive blockades. As to what function the building had, no one is entirely sure. The three chambers you can see in fig. W0777 each had an unusual carved step inside which are thought to have led to a rear chamber, although they may have been benches or altars. 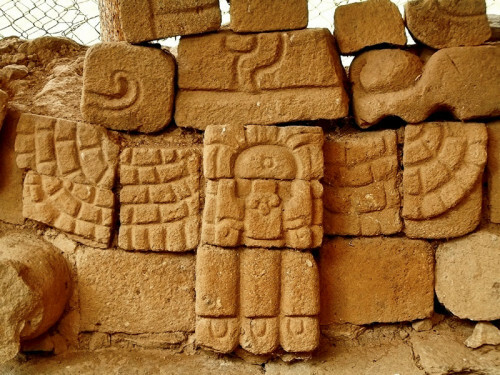 The steps bear hieroglyphs that are thought to give a date of 810AD, making them the last inscriptions at Quiriguá before its demise. Another very unusual feature of structure 1B-1 is the motif found to the left of the stairway (fig. W0779). The motif features a pair of human arms extended as though imitating bird-wings. The arms emanate from a head which on first glance appears to be that of a frog or toad – a theme which is thought to have been used in Zoomorfo G – but the double circles which rise from the head like eyes seem to suggest a crab. However, closer inspection shows it could be two toad heads, on on top of another. 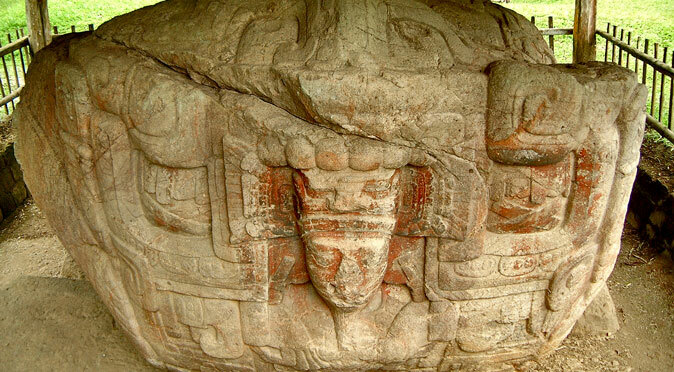 It is probably that the motif is representative of Jade Sky in some way and that Structure 1B-1 was his palace. Directly to the right of structure 1B-1 in fig. 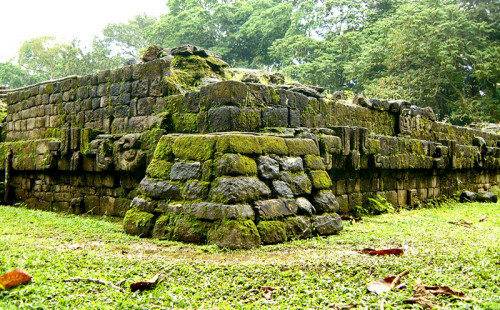 W0777 are the single storey remains of Structure 1B-2. As you can see, Structure 1B-2 appears to be built on the acropolis floor, but this wasn’t always the acropolis floor and the whole acropolis plaza is raised by several metres and it is the buildings of Jade Sky that make it look sunken rather than raised. It would appear, therefore, that this is an older building and must have held great importance to have escaped being built over. Fig W0971: Rear of 1B-2In fig. W0971 you can see the rear wall of Building 1B-2 which is also the external south-west corner of the Acropolis and leads directly round to the wall seen earlier in fig. W0970. The differences are clear. 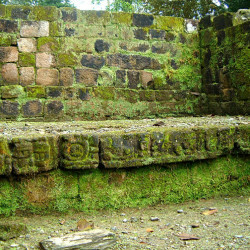 The walls of Structure 1B-2 are ornate and feature a band of carved stone. The corner is buttressed to provide strength, as the wall is vertical and is external wall of a room. The rear of Structure 1B-1 is far taller and is of a sloped layered design, with the walls filled with rubble and the palace built on top. 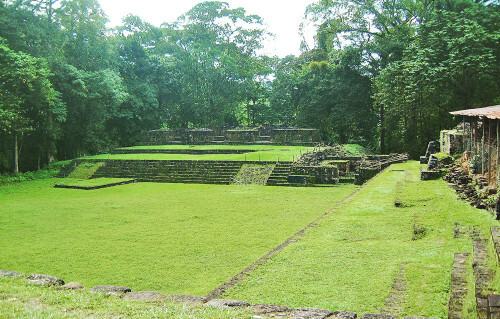 Structure 1B-2 is thought to be the palace of Quiriguá’s greatest ruler, Cauac Sky (officially called K’ak’ Tiliw Chan Yopaat), which is why Jade Sky chose not to build over it. 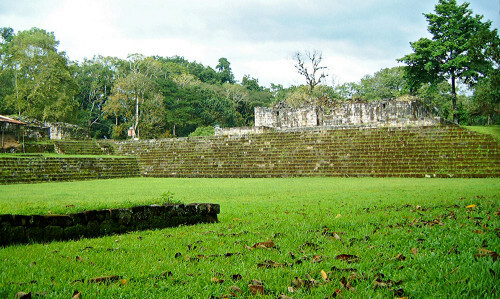 The contrast between Cauac Sky’s ornate design and Jade Sky’s defensive design is another demonstration of how the last ruler of Quiriguá, Jade Sky, was not as confident as the previous two incumbents of the throne and felt it necessary to shore up the defences of the Acropolis which acted as his palace complex. Fig W0973: Carved WallFrom building 1B-2, the next building west is Structure 1B-3, which sits on the southern end of a platform which runs the extent of the western flank of the Acropolis Plaza. Fig. W0778 shows the view looking west across the southern end of the Acropolis Plaza from the foot of the stairs leading to Structure 1B-1 (which are just out of shot on the left-hand side). It isn’t known exactly what the function of Structure 1B-3 was, but it appears to have had a second tier that was supported by corbel arches – the remains of which were found crumbled amongst the ruins. You can still a set of stairs that may have accessed the top story to the left of building 1B-3. The western flank overlooked the Motagua River, which Quiriguá was built to control. Therefore, 1B-3 may have been a municipal building designed to oversee the river traffic and where traders would have to pay taxes on their cargoes before heading onwards. There is a near identical building, Structure 1B-4, which sits on the northern end of the western flank and was built during the same period. 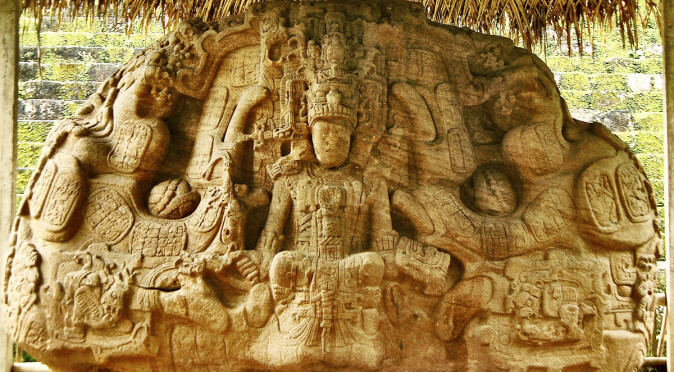 Between buildings 1B-3 and 1B-4 was a glorious carved wall featuring the Sun God, K’inich Ahua. The wall faced west towards the river and was designed to broadcast its message to anyone travelling along the river. Unfortunately, only the crumbled remains of this wall are left standing and are protected by thatched huts. Figures W0972 and W0973 show different sections of the remains, which unfortunately leave much to the imagination. The way in which the frieze was positioned and the way it has fallen down, shows that it was not intended to protect the Acropolis and was solely designed to broadcast power and glory. So important was this message, Cauac Sky took the unusual step of building this western section over a sacred ball-court, which would have been greatly frowned upon despite him building a replacement court to the north of the acropolis, in an area now known as the Ball-Court Plaza. 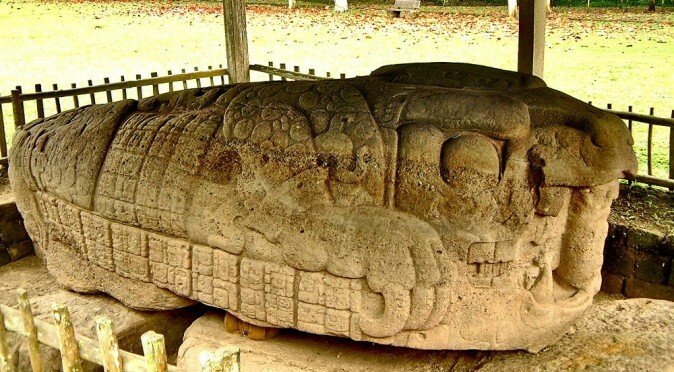 The reason Cauac Sky wanted to assert his and Quiriguá’s power, was that he was striving for independence from Copán and wanted to prove his power and divine status. The western flank of the Acropolis was therefore built to broadcast power and control the river trade. 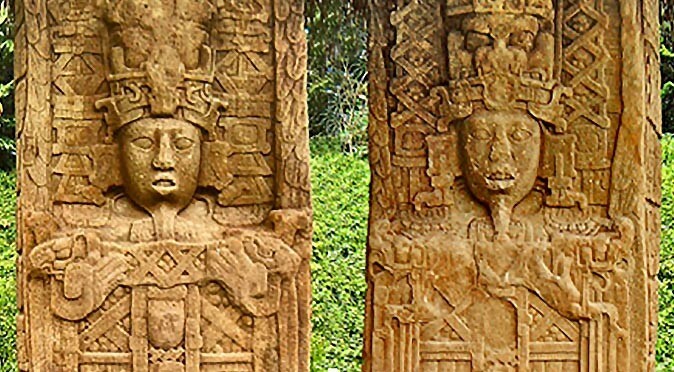 By the time Jade Sky came to power, Calakmul was no longer a superpower and it appears he struck a renewed allegiance with Copán – and this maybe is another sign, or even the source, of his paranoia. By the time Jade Sky had completed his work, the plaza had taken its present shape with interconnecting buildings and platforms creating a continuous structure in a horse-shoe shape on the south, west and north sides, shutting itself of from the city and the river. 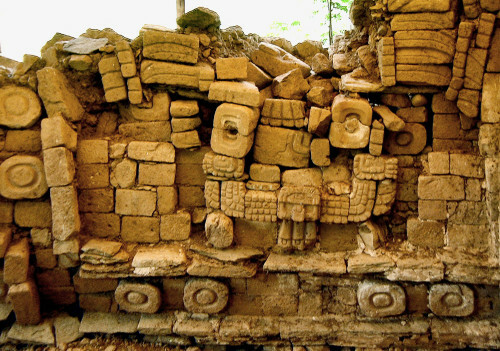 Peculiarly, the only side left untouched was the east-side, on which resides structure 1B-6. 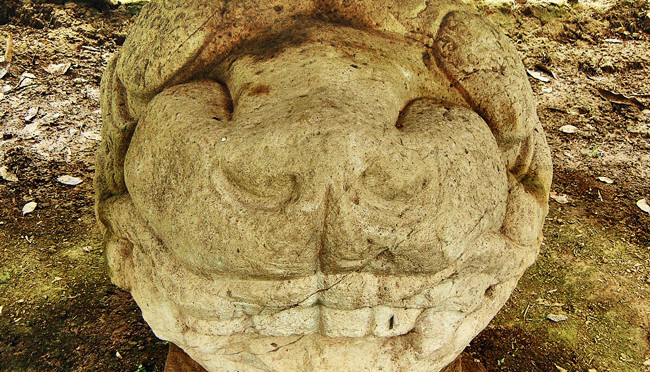 This small building is believed to be a shrine to the ancestors and beneath it archaeologists found the buried remains of an elite male dating to the early classic period – the time when Copán founded the city by installing a ruler known as Tok Casper. This sacred building had undoubtedly been protected from development by myth and superstition, but it did leave a gaping whole along the entire eastern side of the acropolis. 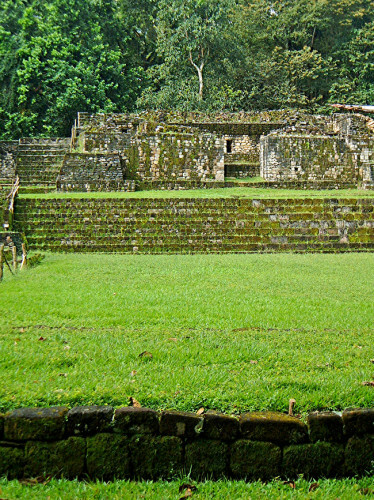 It is probable that Jade Sky did intend to renovate this side, but shortly after Structure 1B-1 was completed the city fell into terminal decline (click here to read more about the history of Quiriguá).